Tired of losing on PUBG? Here is your chance to shine! PUBG is an extremely tactical and stealthy shooter game, it requires extremely good weapon skills and positioning when it comes to winning games. Why buy PUBG win boosting you ask? Maybe you are trying to compete in the leaderboards and are looking to cash in a few extra wins, maybe you are a new player and want to experience how it feels getting to the late stages of the game, when the gas circle is getting smaller and the action is getting more and more intense. We have a duo, squad and solo options, playing duo or party with one of our highly experienced PUBG win boosters can help you learn how to get better at winning games yourself. Yes, all you need to do is select the "Duo Queue" option and you will be playing with the booster. Can I get banned for buying wins boost on PUBG? Every order is usually started within an hour and completed as soon as possible. Gets 5/5 for completion, but it did take a really long time to complete this. Like a week. PlayerUnknown Battlegrounds (PUBG) is one of the most popular Battle Royale games, directed by Brendan Greene, the pioneer of the Battle Royale genre, himself. PUBG puts 100 players in one remote island for a one-of-a-kind showdown. The last man standing is the winner. Unsurprisingly, it has quickly become a hit. With 1/100 chance to win in every game, it’s an understatement to say that it’s hard to accumulate PUBG wins. If you want to rocket your win rate, the easiest option is to buy PUBG Win Boosting and let professionals handle your account. PUBG starts by having 100 players parachute from a plane towards a 18x18 kilometer island. Each player will search for their own weapons and gears. The goal is to kill all the enemies while avoiding being killed. Throughout the game, the safe area decreases over time. Players caught outside the safe area will be subject to health damages until they die. Thus, they must travel into the safe area, forcing themselves to encounter other players. The last player left alive wins. The game has a reputation for allowing players to play and even win the game while AFK. In fact, it is said that the game relies heavily on luck. If you can’t find a gun as soon as you can, you might die. If you land too far from the safe area, you might die. If you hit an invisible bump and get flipped, you might die. Topping the already low chance of winning with bad luck, you can say that it’s no easy feat to win the game. However, it is not impossible to get your win. With the right tactics and weapons, you can win the game. Professional players of PUBG have higher chances of winning the battle royale than those who are not. If you want to increase your wins, you can simply get a PUBG Boost. If you are tired of losing in PUBG, you can get professional help. See an increase in your rating and reward your account with a number of wins through a PUBG Win Boost! All you need to do is to specify the number of wins you want to get, determine the perspective you want to play with and the queue type, and provide the server you are using. 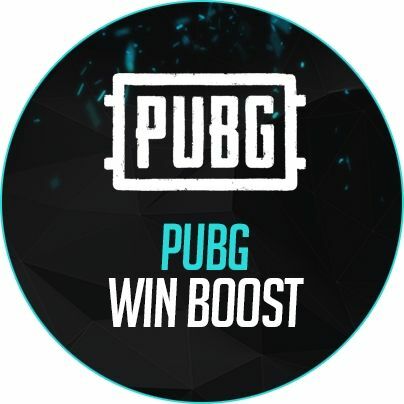 Once you make your payment and buy PUBG Win Boosting, a professional booster will take over your account and will work towards giving you your desired number of wins. Increase your win rate and tell your gamer friends. Skip to the late stages of the game by allowing a pro to get you the small safe area circle. Learn how to play the game by playing duo or squad with a pro player. Get better at the game while observing a pro player. If you are not yet sure whether you want to use Pro Boosting, take a look at the advantages below. With Pro Boosting, you have several options—you can let the booster take over your account and play solo, play with the pro using the Duo Queue option, or add a pro player in your squad. The fastest way to get more wins is to allow the pro player to play solo. However, if you are hesitant to give your account information and want to learn the tricks of the game, you can play Duo. Play squad only if you trust your other members. If you don’t want your other friends to know that you are using a pro to play your game, you need not worry as the Boosters play using the offline mode. Track you PUBG Win Boost through contacting the Booster. Before the start of the game, you can ask the Booster what time you’ll be able to contact him again. Direct live chat with the Booster also allows you to ask for the progress of the game in real time. Once you have made your order, the Booster will start within an hour. We use a database that allows us to instantly work on your order right after purchase. You can contact your own Booster via live chat to ask about the process. You can also contact our customer support. When playing solo, a Booster can get 1-2 wins within 24 hours. We do not use hacks or cheats in our PUBG Boosting, thus we can assure that your account will not be subject to investigation. Also, you will not get banned while letting a pro use your account. However, it is advised that you don’t use your account until the Boosting finish the job. When you have questions about how the game is progressing, ask the Booster directly. If you are worried about your inventory, we can assure you that we will not make changes to it. We will only focus on getting more wins. Our customer support will be available 24/7. Whenever you have questions, you can send them a message via live chat anytime. Trained to assist and answer game boosting-related questions, they will be more than happy to help you whenever you want to clarify, modify, or report something. If you have a misunderstanding with your Booster, the customer support will help you settle things. We will not let a penny go to waste. You will get the worth of what you’ve paid for. Using pro players and security systems, we can ensure that you will have nothing short of the best. We also have several payment options so that you can choose which one is the most accessible to you.